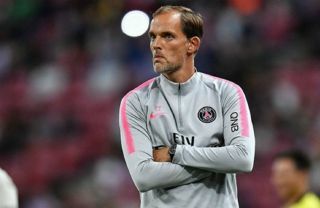 Paris Saint-Germain boss Thomas Tuchel has suffered another injury setback ahead of his side’s meeting with Man Utd in the Champions League on Tuesday. The Euro giants clash at Old Trafford in the first leg of their last-16 Champions League tie, with both sides undoubtedly desperate to take an advantage into the second leg in Paris on March 3. Unfortunately for the reigning Ligue 1 champions, they’ve been dealt with injury blows ahead of the first encounter, with Goal.com noting that Neymar and Edinson Cavani have been ruled out, while Marco Verratti is short of fitness after struggling with his own issues in recent weeks. Tuchel will be missing another key figure though, as PSG released a statement on Thomas Meunier and revealed that after suffering a ‘light concussion’ at the weekend, he’s unavailable until his next series of tests at the end of the week. Although it’s not as big a blow as the others, Meunier has still made 23 appearances so far this season and scored four goals while providing five assists from the right flank. However, PSG do have options in that department as they could opt to go with veteran Dani Alves or Thomas Kehrer in that role instead, but it’s far from ideal to be losing quality depth ahead of such an important fixture. The French giants have struggled to make inroads in the Champions League in recent years despite the calibre of players that they’ve been able to attract. Tuchel will be desperate to oversee progress in that regard, but with a number of his key players struggling fitness wise, he will hope that others can step up in their absence and ensure that they at least take a positive result back to the French capital next month.